Moonstone B4 Apartment is a luxury three bedroom first floor duplex apartment, set in a small, friendly complex with a large swimming pool and childrens pool. Excellent location, 10 minutes to beach. Moonstone B4 Apartment is a luxury three bedroom first floor duplex apartment, set in a small, friendly complex with a large swimming pool and childrens pool. With an open plan kitchen / living/ dining area, giving the property a light, bright and airy feel. The large balcony overlooking the pool is perfect for al-fresco dining. The fixtures, furnishings and fittings are all top quality. The lounge consists of lovely sofas, coffee table and TV & DVD player. The fully fitted kitchen includes oven, hob, microwave, fridge, kettle, toaster, iron and breakfast bar. The first floor bedrooms feature one double bed and two single beds, wardrobes and bedside cabinets, all the furnisture is top quality, handmade pure oak wood. The attic bedroom has a double bed, en-suite bathroom, bedside cabinets, wardbrobe and balcony. The bathrooms include shower, bath, sink and WC. There is also a safe in the apartment. Moonstone is approx. 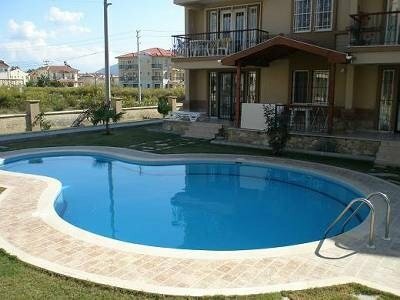 10 minutes walk from the centre of Calis and the Beach. There is a childrens park only 10 metres from the property, perfect for family holidays. Calis is a lovely resort, appealing to people of all ages, with a long narrow sandy and shingle beach. Along the promenade are an excellent selection of shops, restaurants and bars. Fethiye is a 10 minute bus ride away, situated around a wide bay. It is a bustling, friendly market town surrounded by spectacular mountains and stunning scenery. Enjoy a stroll along Fethiye harbour, or relax with a drink or meal in the many restaurants and cafes around Fethiye. Take the bus to Calis, Fethiye, Olu Deniz (blue lagoon), Hisaronu, Ovacik and Kayakoy. Or try the water taxi from Calis front which takes you into Fethiye. There are many activities to do in the area from the water park at Calis, to a daily boat trip from Fethiye exploring the 12 islands. For the more adventurous try paragliding, horse riding or scuba diving. Turkey has many historical sites which are definately worth a visit.